Congratulations to all who participated in this journey. "If I am alone in my ministry, I shall make a fiasco of whatever task is entrusted to me, but if the Blessed Virgin has a hand in it, I can hope for everything." Mass for Mary, Seat of Wisdom Homily offered by Rev. John I. Jenkins, C.S.C. 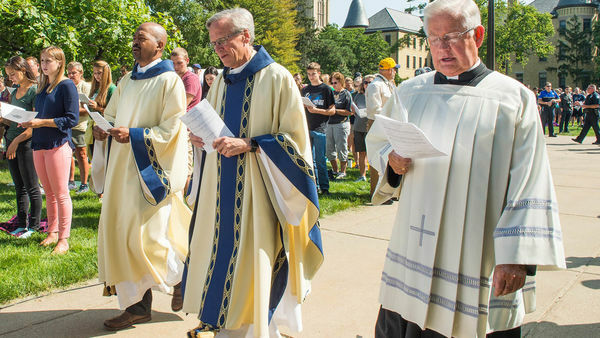 In the tradition of Father Sorin’s inspirational journey and intrepid spirit—our Notre Dame spirit—we retraced his journey from Vincennes to Notre Dame. We traveled those miles in a collective renewal of our determination, to rededicate ourselves to Notre Dame’s mission to seek God, study the world, and serve humanity—to boldly lead the way into the new chapters of our story.